For the ruffed grouse - and ruffed grouse hunters - it doesn't get much better than Minnesota. The popular chicken-sized game bird has a range from coast to coast in Canada and the U.S., stretching from Alaska to North Carolina - with northern Minnesota at its heart. In a typical fall, Minnesota hunters bag up to one million ruffed grouse. But with the arrival of summer this year, grouse numbers are sharply down. Biologist Rick Horton holds a male ruffed grouse, which he found dead by the side of a road in the Chippewa National Forest. The ruffed grouse population in Minnesota is down substantially this year. IN THE EARLY SPRING, SONIC BOOMS ECHOING OFF THE ASPEN TREES in the Chippewa national forest near Grand Rapids signal the presence of ruffed grouse in Minnesota. In the shelter of thick, young stands of aspen, fluffed-up male grouse mount fallen logs for prominence and stability and furiously beat the air with their wings, sending out a booming noise to potential mates. For half a century the Department of Natural Resources has tracked grouse numbers by listening for this "drumming," and found that grouse populations fall and then rebound again about every 10 years. So when drum counts plummetted this year by 40 percent, it was in line with the cycle and didn't catch biologists by surprise. What biologist Rick Horton and his colleagues were looking at was earlier in the cycle. "What we have seen is that the highs of the cycle over the past 40 years haven't been as high - they're progressively lower," he says. Horton is the Minnesota biologist for the Ruffed Grouse Society, and his mission is trying to understand the ups and downs of this little game bird. He calls grouse population cycles "one of the last great mysteries in wildlife management." The mystery involves the complex symbiotic relationship between a bird and its habitat - in this case the dense, young aspen forest near Skeeter Lake that Horton has chosen - to demonstrate why grouse love it here in Minnesota. The first, and only, grouse of the day came early, on the way out to the trailhead. "This is a male ruffed grouse - they come in two color phases, and this is a red phase," Horton notes. Grouse with reddish tails are more common where the climate is milder. The longer tail feathers - about the length of a dollar bill, with a pair of spots - show this is a male. The neck is banded with the usual black "ruff." This time of year, at the bottom of the grouse cycle, it's rare to get such a good look at a grouse - unless, like this one, it's found by the side of the road. "This bird was hit this morning. He's fresh and in good condition," says Horton. "It's unfortunate to see one get killed, because bird numbers are already down. This one's done his job - we're past the breeding season." A tent caterpillar, one of millions that are eating their way across northern Minnesota's forests this year. View a slideshow illustrating the damage being done by these insects. The declining population has much less to do with traffic than with the state of the forest. The Chippewa National Forest around Grand Rapids is prime ruffed grouse territory, with it's thick stands of aspen trees. "This is the kind of broodering habitat where the hen would bring the chicks right after they hatch," says Horton. "They'd be able to live the summer in here with out fear of predators getting them, because the stem densities are so high that an avian predator like a goshawk would have a hard time flying through this to get to the hen and her chicks." It was a long tough winter for wildlife this year, and Minnesota's grouse have suffered with the rest of us through an unusual spring. "We had the cold, wet weather - about 16 days of it - right during grouse nesting and hatching periods. Normally, grouse can withstand quite a bit of cold, wet weather. But when it gets extended like this, it gets difficult. And if those chicks get chilled, they will die," says Horton. This year another natural phenomenon inspired Minnesota biologists to throw a new relationship into the mix. The population of forest tent caterpillars in Minnesota also spikes every 10 years or so. This year is one of those years. Here near Grand Rapids the two-inch bugs, sometimes called army worms, cling to every tree and have devoured scattered patches of foliage. Farther north they inhabit forest acres by the millions, and rain down a constant shower of droppings from the canopy. "It's interesting that we plotted the areas denuded or affected by army worms against the grouse cycle and found there was some sort of correlation. Army worms were peaking just after grouse population peaked," Horton says. The caterpillars and grouse are clearly interrelated, but biologists aren't sure exactly how. On one hand, the fat bugs make a good meal for a grouse. On the other, when the caterpillars eat away the tree cover it leaves grouse vulnerable to goshawks and other eager predators from above. The link has piqued the interest of scientists, and given them one more connection to study in deciphering the formula for the life cycles in this forest. For Horton, looking after the ruffed grouse has become as much about the aspen forest habitat as the grouse themselves. "Aspen is very important for grouse, and we could even speculate that the two evolved together. They use it at all different stages of their life and different stages of the aspen's life," he says. 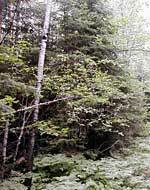 A stand of thick, young-growth aspen in the Chippewa National Forest, which is the favorite habitat of ruffed grouse. Grouse-lovers are lobbying for more aspen growth, even while the DNR and the forest industry are pushing for more diversity of species. Grouse-lovers lobby and educate for forest management that leaves room for new aspen growth. At a recent forest summit in Grand Rapids, aspen proponents like Horton squared off with DNR commissioner Allen Garber - as well as environmental and business interests - who would like to see a heavier emphasis on pine and spruce in Minnesota forests. When autumn rolls around, of course, the dip in grouse numbers could mean the most challenging hunting in quite some time. Ruffed grouse will still be big business, as hunters and their dogs come from around the country to trudge along the likes of Skeeter Lake after what Horton calls "the king of game birds." "They're challenging for the dog. They'll flush if the dog gets too close, they'll sometimes run out from under the point. And then when they do flush it's often such a startling explosion it just startles the hunter into inactivity - you just stand there and watch them take off through the branches," says Horton. This fall's haul of grouse will probably still be a striking reminder of just how many are out there. And as the cycle turns upward once again, their drumming from the among the dense branches will be closely followed as a bellwether of Minnesota's aspen forest habitat.